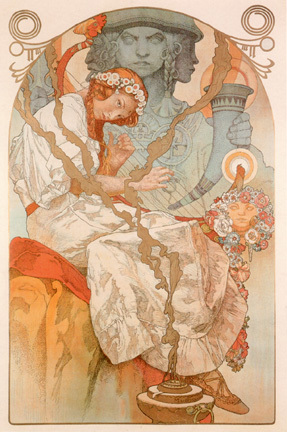 This poster was prepared by Mucha for the first exhibition of the complete Slav Epic cycle, 20 huge paintings, and its official transfer to the City of Prague as a donation by the artist. The exhibition took place between September 23 and October 31, 1928, coinciding with the 10th anniversary of the Czechoslovak Republic which was also being created at this time. For the top half of the poster, Mucha took a portion of one of the pictures that comprised the Slav Epic, 'An Oath Under the Slav Linden Tree'. The mythical figure in the background is Svantovit, the supreme god in Slav mythology, who had three faces representing the past, the present and the future. His emblems were a sword, which he is holding in his right hand, and a horn (used as a drinking cup).